As Lankans all of us are expected to know our own great people whether they belong to the majority community or not, don't we? But most of us say, 'Oh no, we don't understand other languages and we don't know who they are'. That's funny. If we don't know, shouldn't we try to find out or learn other languages to know more about what we don't know? If arrogance prevents us do that, then we are the losers. If we are a multilingual, multicultural and multiethnic, multi-religious society, then we should know each other thoroughly to live as one unit or people of one nation. Isn't it? Well that is logic. These aside, let us know more about a person who was associated with our country. Have we heard of one Ahmed Orabi Pasha? No. Sure, you have seen the name board bearing his name in Mahanuwara! Without much ado let us know the National Hero of Egypt. In fact, there is a booklet written by the late A.M.A.Azeez (1911- ). Please don't ask me who the latter was! .Not to digress- he was a former Civil Servant born in Yaalpaanam, principal of Zahira College in Maradana, a senator, an educationist, an author and an intellectual. The Embassy of Arab Republic of Egypt in Lanka has a wing called the Orabi Pasha Culture Centre in Mahanuwara or Senkadagala. On August 15, 2009 the 126th Commemoration of the great Egyptian was observed. On that occasion a booklet was lunched. The book was the late Dr A M A Azeez's address of welcome made on the unveiling the portrait of Ahmed Orabi El Misri. The publishers are Orabi Pasha Foundation and Dr A M A Azeez Foundation. 'Kalabooshanam' M Y M Meeadhu has helped in editing the text. In his editorial MYM gives valuable information to the uninitiated. Mahroom Ahmed Orabi Pasha of Egypt arrived in Lanka on January 11, 1883. He was the Leader of the National Revolt in Egypt. M C Siddi Lebbe (credited to be one of the pioneer novelists in Thamil in Lanka) described the Egyptian and the state of the Muslims then as " he preserved like a seer the plight of Muslims who were educationally backward, economically stagnant, culturally isolated, religiously obscurantist, intellectually sterile and politically insignificant"
The dream of Siddi Lebbe became a reality when Al Madrasathuz Zahira was founded in 1892 with the active patronage of Arabi Pasha. Orabi Pasha even after the demise of Sidi Lebbe devoted the rest of his days in then Ceylon to promote English education and reforms in religious practices. The dream of Siddi Lebbe became a reality when Al Madrasathuz Zahira was funded in 1892. Dr A M A Azeez resigned from the Ceylon Civil Service to take up the position of the Principal of Zahira College. He rendered noble service for 13 years. Azeez had this to say of Orabi Pasha: "His name will be remembered with reverence not only in the land of his birth but also in our land, the land of his exile. And Zahira will for ever remain an imperishable monument to the immense influence for good which he exerted on the local Muslim community." 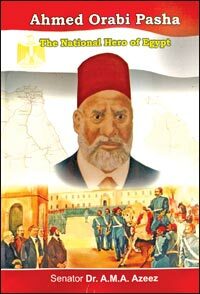 It was ordained that the national Hero of Egypt, Ahmad 'Orabi' should spend the best part of his life, a period of nearly 19 years, from January 11,1883 to September 1,1901 in Ceylon -the land of the exile"
Orabi reached Ceylon in 1883 to serve a life term of banishment, having been found guilty of treason and rebellion as a subject of the Khedive and guilty of mutiny as an officer of the army and having been painted by the foreign press as " a heavy fellah" and " the mere mouthpiece of a turbulent soldiery"
But the verdict history was: "Ahmad Orabi was the leader of a genuine National Movement which represented the enlightened and liberal elements in Egypt. It was a struggle for freedom from foreign exploitation and an attempt to extract a Constitution guaranteeing the people's rights and safe guarding their interests from a ruler (deposed King Farook) ho had become the helpless instrument for foreign and native reactionary intrigue"
The booklet also contains vintage photographs of yester year covering some of the relevant happenings related to the subject. Readers interested in history would find the late Azeez's speech a very informative address.